In Amarillo the newest fad is having a hydro static test. We made it through the lead-based paint and mold phase. Don't get me wrong, lead-based paint and mold can be very harmful to you. The thing about it is, everyone wanted it tested even though there were no signs that either lead-based paint or mold were anywhere near the property. The same is now true for hydro-static testing. 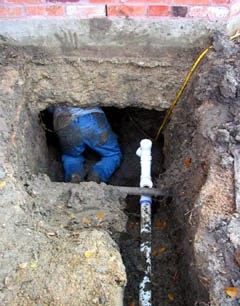 A hydro-static test consists of a plumber fill the pipes full of water while cutting off the water at various strategic places around the property. If the pressure holds, all is well. If it drops a millimeter panic strikes even though the seller has never had any problem whatsoever with the plumbing. Really old sewer lines may in fact leak. In Amarillo we don't have a lot of water so what few trees we have must survive and the closest source of moisture for them are sewer and water lines. They like to wrap around sewer pipes and infiltrate them. When this happens, you can call a plumber to "root it out" to get it free flowing again. Without a doubt this sewer line leaks and eventually it flattens. So, if your test fails, the buyer is undoubtedly going to want it fixed. If your house is pier and beam, you won't necessarily wake up from your nightmare screaming. You can get a price and you know what you are dealing with. The cost can usually be between $3000 and $6000 depending on how big your back yard is and how far it is to the main line. It is mostly impossible for anyone to determine where under the slab the pipe is leaking. Quite often plumbers can get a general idea but not for sure. They use some sort of listening device. Plumbers do not know where the leak is, how hard it is going to be to get to it and what if there are multiple leaks. Because of this, you will not get a very narrow estimate. The best case and worst case can be a difference of thousands of dollars. In our area, sewer leaks can be anywhere from $12,000 to $25,000. This is not good for a seller and often can kill the transaction. Not every sellers has that kind of cash or equity in their property. The method is to take a jack-hammer and bust out the concrete over where the listening device recommended. If you happened to have beautiful imported from Italy tile, this can really be a bad thing. No matter what floor covering you have, it will now need to be fixed/replaced. Not to mention an entire house full of concrete dust. Please don't misunderstand, some sewer/water lines need to be replaced. The pipes are now being replaced with PVC pipe which has a life span of 100 years, about the same as a Walmart bag. Wonder what the next phase will be?